I love all types of Jewelry weather it be earrings, necklaces, rings, and whatever the case may be one thing is for sure I love jewelry!! 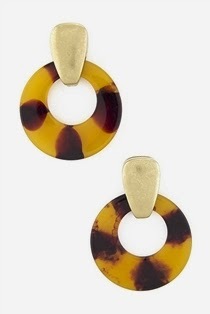 So the pair of earrings I was able to try out are the TORTOISE SHELL HOOP EARRINGS these earrings are super cute and go with about anything. Jewelry is our passion, and when you're passionate about something, you want to share it with the world. Majestical Jewelry was started by a small group of jewelry-addicts in Charleston, South Carolina. Our idea was to offer high-quality, high-fashion pieces at prices that people can actually afford. With so many jewelry businesses marking prices up to outrageous rates, we wanted to create a place that women could purchase necklaces, earrings, charms, and bracelets without over-spending. Though some discount-jewelry brands sell low-quality, cheap imitations, we stay true to our belief that quality makes all the difference. From our gemstones, to our silver, to our fashion jewelry, we stick to our promise and sell only the best. We continue to scout the globe to find the finest, most crave-worthy jewelry pieces we can get our hands on, and we love making these fabulous finds accessible to you! We truly believe every woman has the right to feel Majestical, and our goal is to spread that message. We hope you'll join us.